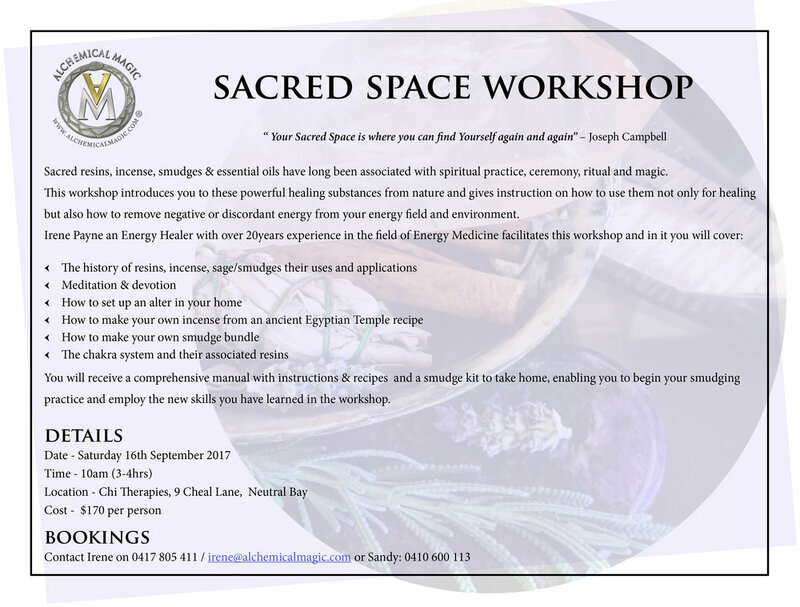 Join us for our Sacred Space workshop and learn about the powerful healing properties of resins, incenses, smudges and essential oils. Irene will teach you how to use them not only for healing but also how to remove negative or discordant energy from your energy field and environment. Sacred resins, incense, smudges & essential oils have long been associated with spiritual practice, ceremony, ritual and magic. This workshop introduces you to these powerful healing substances from nature and gives instruction on how to use them not only for healing but also how to remove negative or discordant energy from your energy field and environment. You will receive a comprehensive manual with instructions & recipes and a smudge kit to take home, enabling you to begin your smudging practice and employ the new skills you have learned in the workshop.